Craig Davidson’s third novel, the gritty Cataract City, deserves all the praise it has received since its release last summer, including a short-list nomination for the Giller Prize. Davidson is usually described as a guy’s writer – rough around the edges, blue collar, rugged – and to be sure, phrases such as “unremittingly masculine” and “testosterone-soaked” have been used to describe his propulsive prose, but he also does a great job of creating authentic characters worthy of our sympathy. The fact that Davidson took steroids to research his boxing novel, The Fighter, does indeed add to that manly vibe. But beyond his subject-matter, Davidson likes to entertain us in the same way that an action flick does, by keeping us on the edge of our seats. 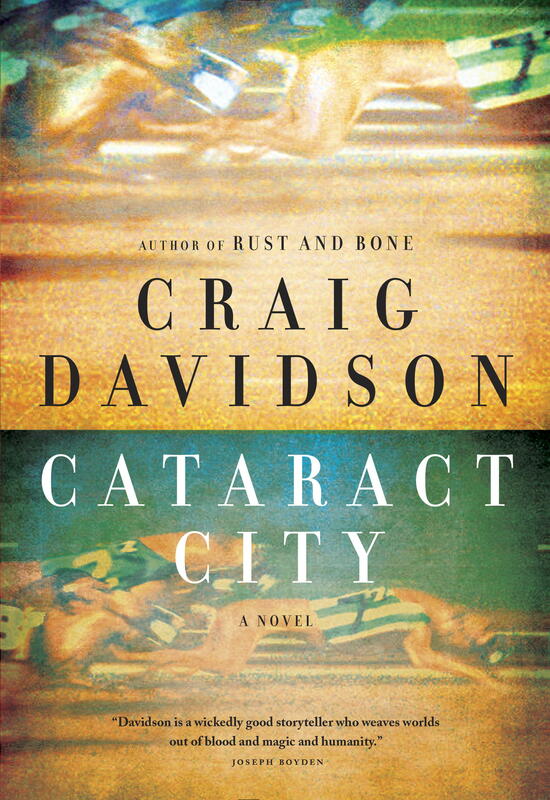 And with Cataract City, we see Davidson using his favourite tropes – boxing, greyhound racing, dog fighting, basketball, the Niagara setting, and strained male relationships – in his attempt to flesh out the novel’s main character, the city itself. The novel deals with two childhood friends, Duncan (Dunk) Diggs and Owen (Owe) Stuckey. They’re kidnapped when they’re twelve years old and taken out into the woods, but their kidnapper dies and the two boys are left to find their way out of the Niagara forest on their own. They wander for three days, but manage to survive. The boys grow up but the incident changes them forever. Owe manages to get out of Cataract City and later becomes a cop, while Dunk never leaves, landing a job at the local factory (The Bisk), and exploring the darker side of his city – bare-knuckle boxing, dog fights, and smuggling, to name just a few. Through it all, Duncan remains remarkably grounded, but that doesn’t stop him from getting into trouble and being sent to prison. Davidson’s prose is cinematic, tense and fast-paced. Cataract City demands to be read as fast as you can absorb each of its vivid scenes. The boys’ wilderness ordeal gets the book rolling at a fast clip, throwing in all sorts of obstacles along the way. This section is reminiscent of Stephen King’s novella, “The Body”, with its coming-of-age in the woods plot line. Davidson even has Duncan say “Sincerely,” just like Vern in King’s novella – a sly little nod to his inspiration perhaps? The novel doesn’t slow there, as it sets up the events leading to Dunk`s eight-year prison stint. There is violence, blood, and revenge, both petty and not so petty. At times, Davidson’s book felt very much like a David Adams Richards novel, as Cataract City questions that blurry distinction between right and wrong. It also has a sort of big bad enemy, which Richards is fond of using. Cataract City is not a perfect novel, but it is an intense read that entertains with bravado, while also serving up very human characters. Davidson has hit his stride here, and serves up a strong story about the meaning of friendship and the ties that bind.